Upon first viewing, Deadpool came across as a typical superhero origin story buoyed by a fantastic Ryan Reynolds performance as the title character, a role he was born to play. Repeat viewings brought Reynolds’ Deadpool to the forefront, and any narrative shortcomings fell by the wayside, making Deadpool a near-classic in the superhero genre. Methinks the same will be said of Deadpool 2 after seeing it more than once. As promised in the Deadpool post-credits stinger, the Merc with a Mouth indeed goes up against Cable (Josh Brolin), a mutant from the future who’s part robot. 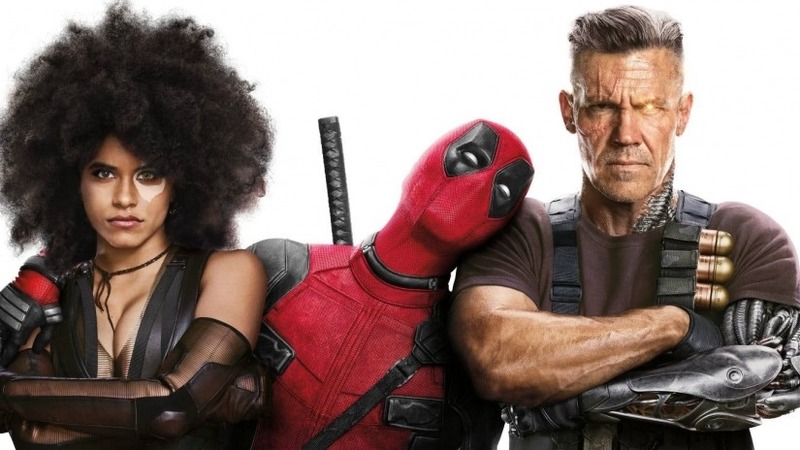 To combat this threat, Deadpool creates the X-Force, which includes Domino (Zazie Beetz), a mutant who is effortlessly lucky. To say more of the plot would be a disservice, since the trailers have done a great job of teasing what’s to come in the film without revealing any of the surprises – and there are plenty of those, before and during the credits. The jokes, both meta and non-meta, fly fast and furious in Deadpool 2, even more than its predecessor. The jokes come from every direction, and are so random it feels like the filmmakers spent a weekend on a coke-fueled bender coming up with every joke possible to put in the sequel. Even Reynolds, who’s acted as a steward for Deadpool for years, receives a co-writing credit with original Deadpool writers Rhett Reese and Paul Wernick. Most of the jokes land, even if the film itself sometimes struggles to maintain a consistent tone between serious, silly and meta. But that’s a minor gripe. Atomic Blonde and John Wick co-director David Leitch takes the reins from Deadpool’s Tim Miller, but largely keeps the same ascetic from the first film in place. It allows for consistency, but the next-level action Leitch oversaw in Wick and Blonde barely makes an appearance. Apart from starting off with a common sequel pitfall - coasting on the audience’s familiarity with the characters - there really isn’t much in Deadpool 2 to gripe about. It’s consistently funny and sometimes laugh-out-loud hilarious, and once the narrative kicks in things move very quickly, giving any bits that don’t work a swift and merciless end. Brolin and Beetz are perfect as Cable and Domino, though their presence takes away screen time from characters that appeared in the first Deadpool, mainly Blind Al, Weaseal, Negasonic Teenage Warhead and Colossus. Deadpool 2 is a ridiculous amount of fun. It’s not quite as good as the first Deadpool, but honestly that’s like the difference between getting an A on a test and an A-. It’s not worth making a fuss over. Just enjoy the greatness that is Ryan Reynolds having the time of his life in a tight, red, leather outfit.